Weekly dances are normally in the Harmony School Gym. The gym is on the west end of the school. Enter from the parking lot which can be accessed from Hunter Street (a block south of Atwater St.), just east of Woodlawn St.
BOTMDG is dedicated to fostering the growth and development of Old Time musicians, callers, and dancers in a nurturing and friendly atmosphere. We are a non-profit organization based in Bloomington, Indiana, that is run entirely through the efforts of volunteers — your help is always needed and welcome! We sponsor a contradance EVERY WEDNESDAY evening (no exceptions!) and several special dances throughout the year. All dances feature live music (Old Time, New England, and Irish dance tunes). Callers lead mostly contradances, with some squares, mixers, and other dances forms as well. This type of dance has a devout and enthusiastic following around the world. BOTMDG is one of the oldest groups of its kind in the country, and has danced every Wednesday since the group started in 1972. 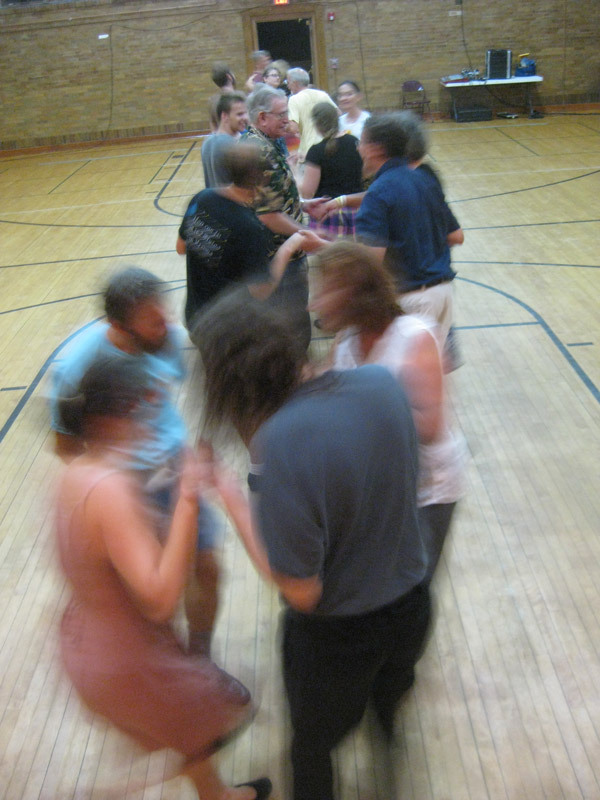 Are you new to contradance?